The statistical analysis of cost-effectiveness data is becoming increasingly important within health and medical research. 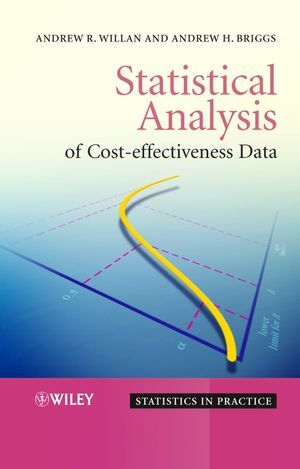 Statistical Analysis of Cost-Effectiveness Data provides a practical book that synthesises the huge amount of research that has taken place in the area over the last two decades. an overview of statistical methods used in the analysis of cost-effectiveness data. illustrated throughout by worked examples using real data. suitability for health care professionals with limited statistical knowledge. discussion of software used for data analysis. An essential reference for biostatisticians and health economists engaged in cost-effectiveness analysis of health-care interventions, both in academia and industry. Also of interest to graduate students of biostatistics, public health and economics. Dr.Andrew R. Willan is an academic biostatistician and clinical trial methodologist, and currently holds the positions of Senior Scientist Emeritus at SickKids Research Institute, Professor of Biostatistics in the Dalla Lana School of Public Health at the University of Toronto, and Professor Emeritus in the Department of Clinical Epidemiology and Biostatistics at McMaster University. His contributions to statistical methodology include publications in the areas of cost-effectiveness analysis, value of information methods, management trials, crossover trials, non-nested regression analysis and bivariate response models. Dr. Willan has been particularly instrumental in developing the field of statistical analysis of cost-effectiveness data with twenty peer-review articles and a book, co-authored with Professor Andy Briggs, in the Wiley Statistics in Practice series, entitled Statistical Analysis of Cost-effectiveness Data. 1.2 Cost-effectiveness data and the parameters of interest. 1.3 The cost-effectiveness plane, the ICER and INB. 2. Parameter Estimation for Non-censored Data. 3. Parameter Estimation for Censored Data. 4.4 The cost-effectiveness acceptability curve. 4.6 A Bayesian incremental net benefit approach. 5.3 Symptomatic hormone-resistant prostate cancer. 5.4 The Canadian implantable defibrillator study (CIDS). 5.6 Bayesian approach applied to the UK PDS study. 6. Power and Sample Size Determination. 6.2 Approaches based on the cost-effectiveness plane. 6.3 The classical approach based on net benefit. 6.4 Bayesian take on the classical approach. 6.5 The value of information approach. 7. Covariate Adjustment and Sub-group Analysis. 8. Multicenter and Multinational Trials. 8.2 Background to multinational cost-effectiveness. 9.2 A general framework for modeling cost-effectiveness results. 9.3 Case study: an economic appraisal of the goal study.